The University of Hawaii at Manoa has an updated long-range development plan, calling for pedestrian malls to replace many of the streets at the center of campus. 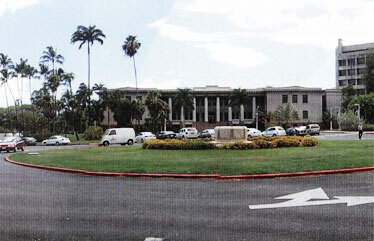 Top: A photo shows Varney Circle in front of Hawaii Hall. Bottom: An artist's rendering shows what it might look like as a pedestrian mall. Someday, when money is not a problem, University of Hawaii at Manoa officials envision, it will be a campus with plenty of parking, pedestrian malls replacing streets, and new classroom and research buildings. New housing for both faculty and students and commercial, entertainment and cultural developments would encourage people to "live, learn, work and play" in Manoa, rather than commute. The vision is part of an updated long-range development plan for the campus, approved in principle by the Board of Regents and being submitted to the city. Some of the themes in the plan like the pedestrian malls, new parking lots and gateways, date to UH-Manoa's first development plan in 1987. The plan was last updated in 1994. There's no estimate of the cost to fully develop the plan, which is intended to be a guide to the development of the Manoa campus, said Kathy Cutshaw, the UH-Manoa vice chancellor for administration. Completion of the buildings planned and the upgrading of existing facilities will depend on funding and other factors, she said. "Circumstances may cause you to alter things in the future," Cutshaw said. This update, along with a parking study and a traffic study, was a requirement by the city as part of the approval process for UH-Manoa's new Frear Hall dorm, Cutshaw said. Since the 1994 update, the university has completed several construction projects called for in the plan including the Center for Hawaiian Studies, renovations to Hawaii Hall, the Dole Street parking structure, Frear Hall, the new softball stadium, the Architecture Building and the Stan Sheriff Center. 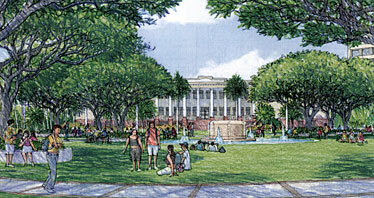 The updated plan focuses on several new buildings planned for the next five to 10 years, including a new parking structure and expansion at Kennedy Theatre, expansion of the Campus Center, a new classroom building at the site of Henke Hall, and new dorms to replace Johnson Hall and Hale Noelani. Beyond the next 10 years, the plan calls for another parking structure on the lower campus with a rooftop tennis court, more student housing at the Hale Wainani parking lot, expansion of the athletic department and an addition to Sinclair Library. The plan also calls for landscaping improvements including the construction of pedestrian and vehicle "gateways" into the campus at University Avenue, East-West Road, Maile Way, Lower Campus Road, and Varsity Place and Kalele Road. The university paid Group 70 International, the consultants who updated the development plan, about $663,000 for the update, an environmental assessment and to apply for the Plan Review Use permit, said Sam Callejo, the UH system vice president for administration.